If you couldn’t tell by now, I like writing articles about big topics — sweeping concepts that teach players how to play this game like an expert. I like peeling apart a broad question like “How do I get better at this game?” until there are no surprises left, until the only thing left for you as a reader to do is go out and apply the principles I talk about. Judging by the number of “likes” I’ve received on my other articles, you guys are with me on this task. This article is no different, and honestly, it’s an article I didn’t think I could write. I picked it up for some time, then went to something else (a different broad question to answer), then finally picked it up again and did my research. This article is an attempt at answering the big question: How does one successfully metagame? It blends together math, stories, real-life examples, and psychology to give you an edge in the competitive Pokémon TCG world. Hopefully, you’ll want to do some detective work of your own and get to the bottom of what motivates players to play a certain deck, and that at some point things will click so that you can confidently make a deck/tech choice that you feel proud of. 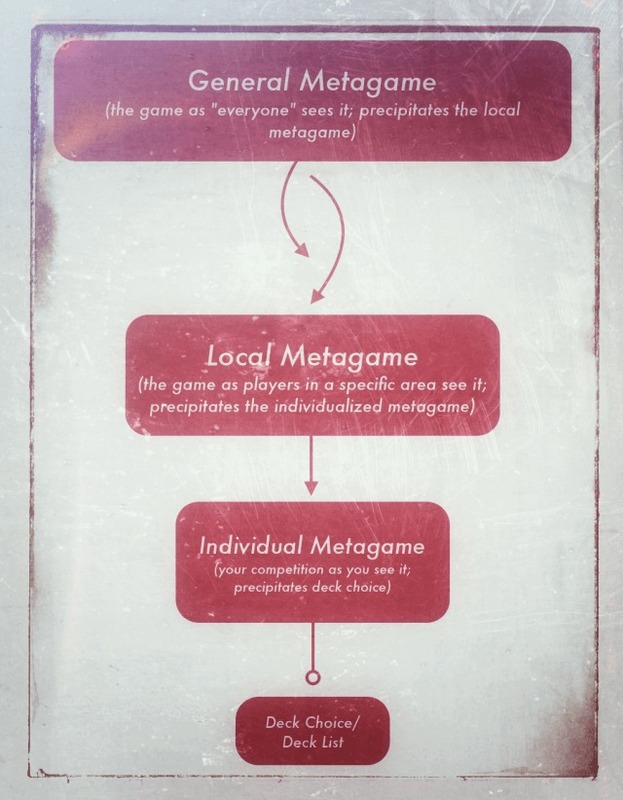 Simply put, the metagame refers to “the game within the game.” Metagaming occurs when a player uses information or resources outside of a game to affect an in-game decision. Consider the game of rock-paper-scissors. For many, this simple game amounts to nothing more than random chance. 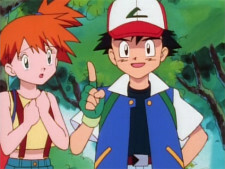 As soon as one acknowledges that certain types of people throw certain gestures, however, the idea of a “metagame” is introduced. If I know, as a simple example, that my good friend Kevin always throws rock, I would be a fool to throw anything other than paper. And if I know that everyone in my area plays fire, I would be a fool to play anything other than water. See where we’re going with this? Keep in mind the term “metagame” is different than “format,” which is a reference to the cards legally playable for a tournament. Therefore, the format can be described as BLW-on (cards released from Black & White to the present are playable), while the metagame can feature “Darkrai/Hydreigon everywhere.” Many people use the word “format” to depict a metagame (i.e., a “rock-paper-scissors” format). I will stray from this misnomer in this article. 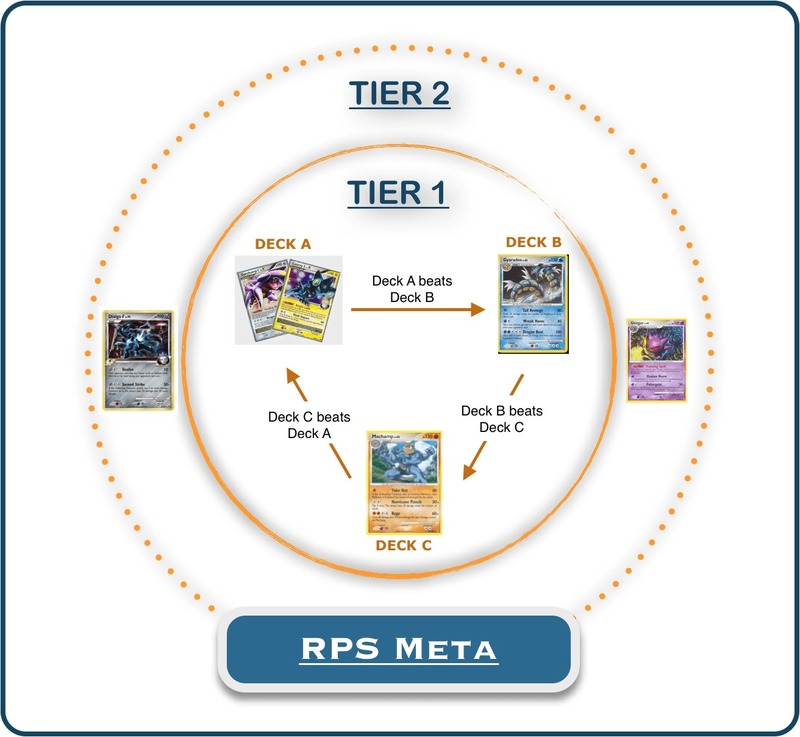 Another word to be familiar with is “tier,” which simply references the relative strength of archetypes within a metagame. A tier 1 deck is recognized as one that commonly wins and is familiar to any serious player. Tier 2 decks have some success, but are recognized to have some general flaws. Tier 3 and so on are considered fringe decks, ones whose success are met with surprise. One more thing about metagames is that many players make a distinction between the “general” metagame and the “specific” metagame. The general metagame is the game as everyone sees it, while the specific metagame is the game as local players see it. In most cases, the general metagame greatly affects the specific metagame. I’ll go further into detail on these layers of the metagame elsewhere in the article. 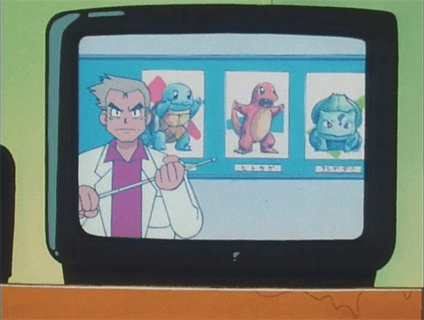 pokemon.theirstar.comThere are a couple of items to be mentioned before I continue with this article, both of which might be overlooked otherwise. First of all, the advice given in this article is meant to satisfy the player whose goal is to achieve the highest number of wins possible while playing the Pokémon TCG. If you only want to win with a rogue deck or you shy away from the best deck for a given metagame because you “just don’t like it,” take the advice I provide here lightly. Second, keep in mind that there are many random factors involved with playing the Pokémon TCG and that no matter how much work you put into metagaming, you still might lose. While this article will provide you with tools and considerations to help you form a clear opinion of your metagame and deck choice, it in no way guarantees your success with the game. There will still be days when you show up with what you feel is the best possible choice and lose because of bad luck or that rare player who was one step ahead of you. When this happens, find solace in the fact that you did your best. 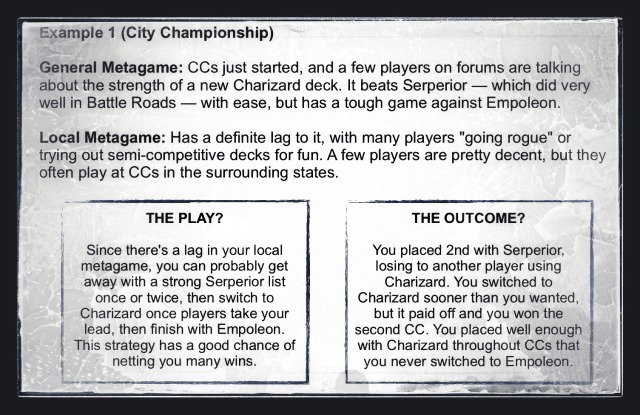 Ultimately, every single tournament of the Pokémon TCG ever held had a metagame associated with it. Even Booster Drafts and Pre-Releases, which seem unpredictable, see patterns adopted by various players (I always look for Basics with attacks that either draw cards or search for Pokémon). x-entertainmentA defined metagame refers to one in which you have a really good idea of what you will face at a given tournament. The Pokémon TCG is unique here because the world outside of Japan gets a head start in being able to predict the general metagame since Japanese players get sets well before everyone else. As a result, most players worldwide have a sophisticated notion of how the game will change with every new release. Within defined metagames, some noticeable patterns emerge. The Rock-Paper-Scissors (RPS) Metagame is one represented by 2-3 strong tier 1 decks, plus a similar number of tier 2 decks. The strategic interchange here occurs between a small number of decks, much like the choices in a regular game of rock-paper-scissors. 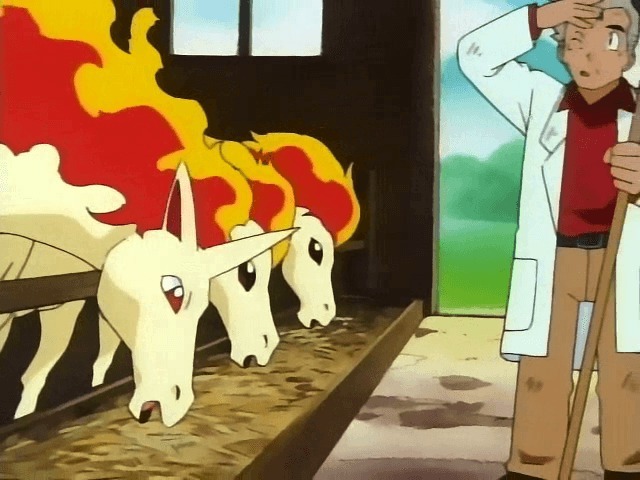 RPS Metagames are not uncommon in Pokémon, due perhaps to easily recognizable weaknesses for any deck — that is, rock-paper-scissors is much the same as fire-water-grass, with each deck having a strength and a weakness. The RPS Extended Metagame is akin to rock-paper-scissors-lizard-Spock. Represented by 4-6 strong tier 1 decks and a similar number of tier 2 decks, the strategic interchange here is a bit more complex, but the core idea is still the same. Each deck now has its strengths and its weaknesses (note the plural). A mature RPS Extended Metagame can be very thrilling, with different decks winning from tournament to tournament. The Static Metagame occurs when elements of that metagame do not change for a long period of time. 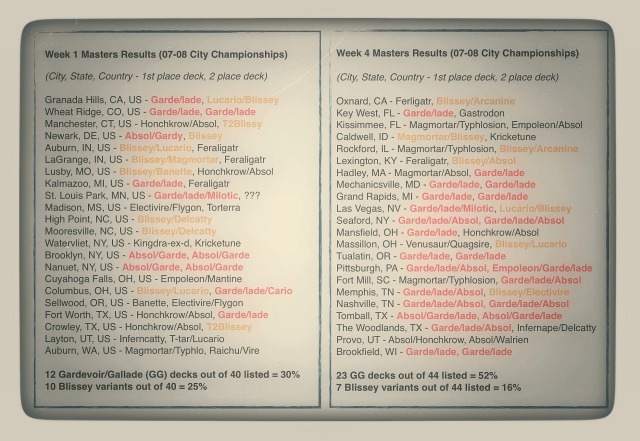 During the 2007-2008 season, Gardevoir/Gallade decks became the unrivaled “best deck in the format” (BDIF), starting with City Championships. It maintained this designation for the remainder of the season. The Counter-Counter Metagame occurs with the rise of a BDIF that is effectively countered by a mediocre card or deck. 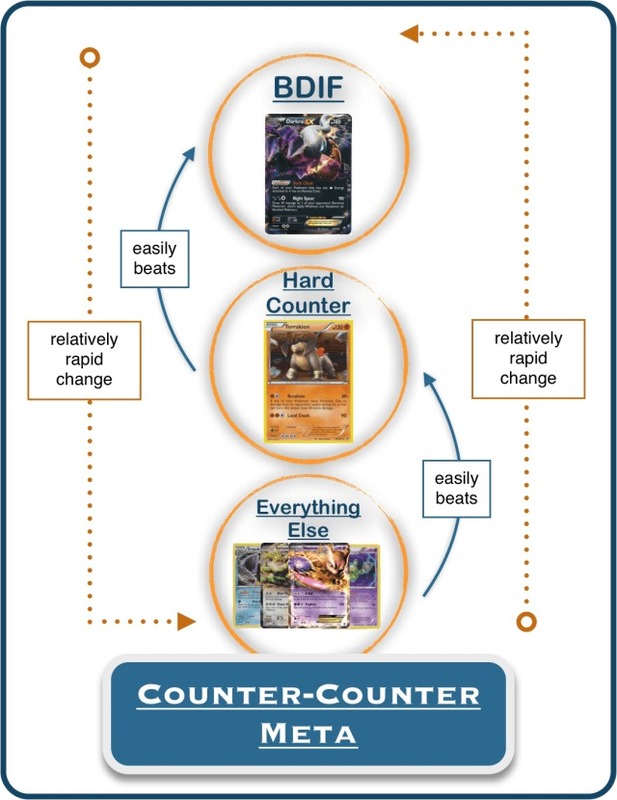 The pattern for this metagame is interesting: a deck becomes the undeniable BDIF, players find a good counter for that deck that is otherwise lackluster, the success of the counter encourages players to use other decks that easily beat the counter, the original BDIF once again claims its spot when the counter disappears, and the cycle repeats itself. In this instance, it’s as if the only thing stopping the BDIF is that one counter card/deck. The rise of Darkrai DEX as the BDIF spurred this metagame as Terrakion NVI — an otherwise mediocre card — became the perfect counter to Darkrai’s dominance (incidentally, the deck that won Worlds in 2012 featured both Darkrai EX and Terrakion NVI). 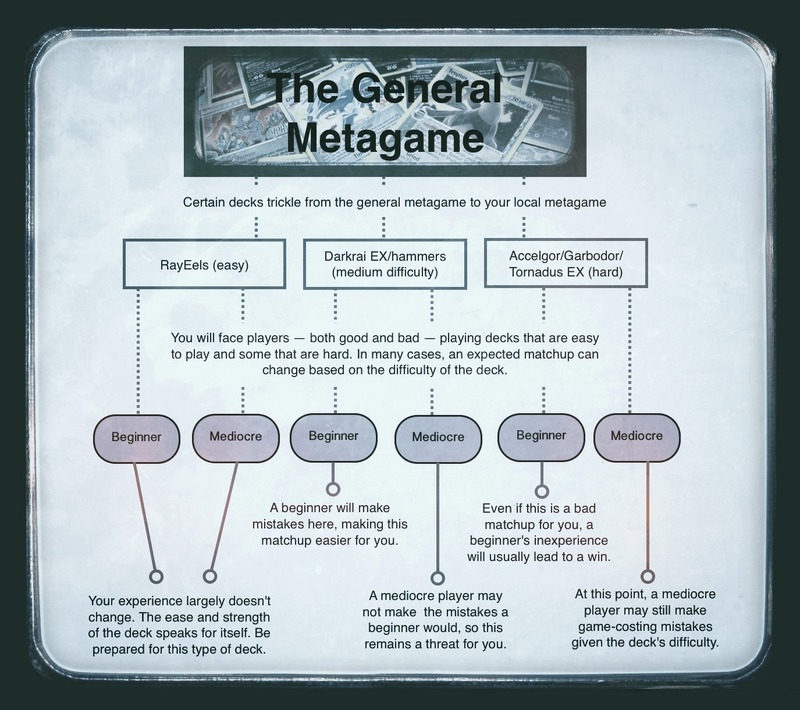 Though I will get into how you can effectively compete in each of these metagames later on, the general rule for a defined metagame is to play a deck that is good in a specific sense. 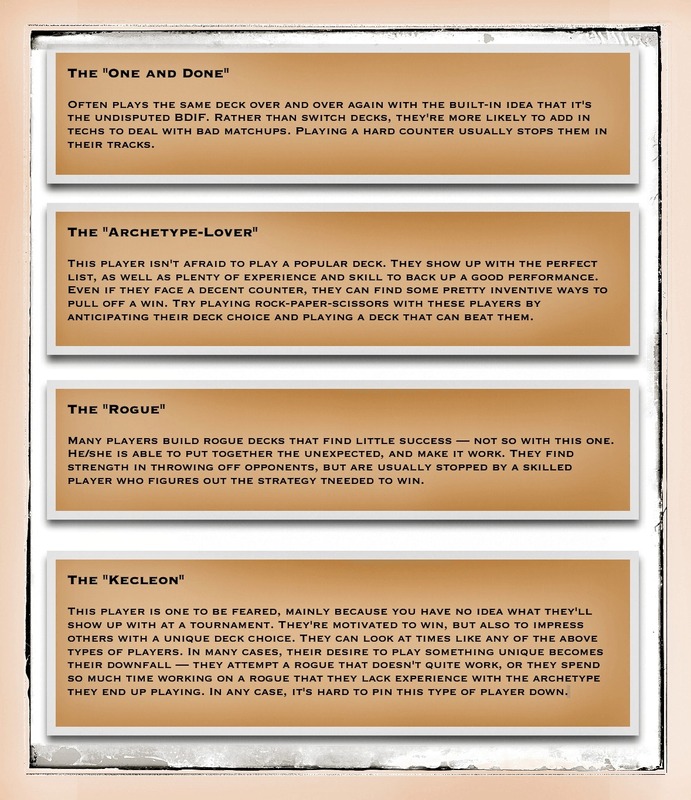 In other words, your deck choice is based on specific decks you expect to see. 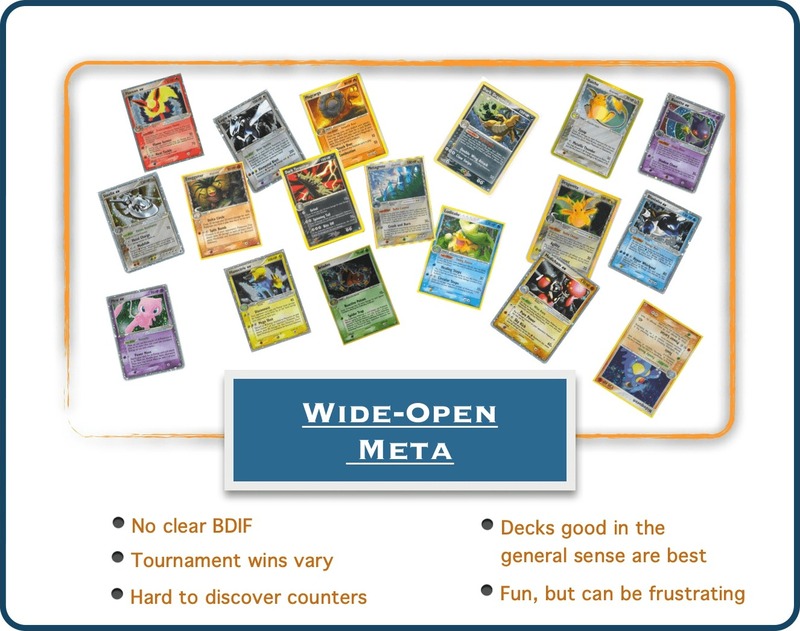 An undefined metagame is one in which you have little idea what to expect at a tournament. 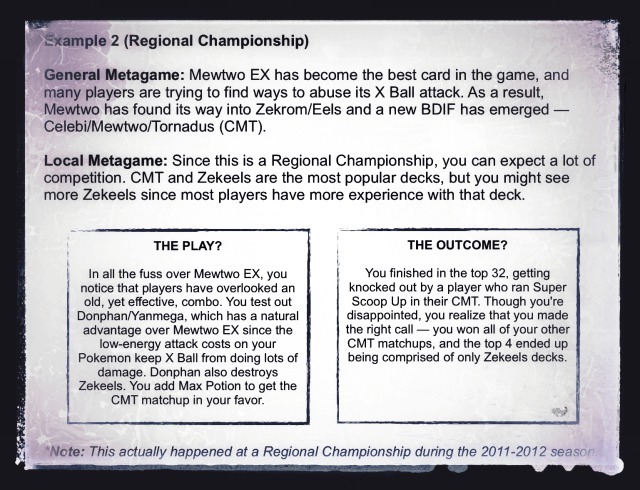 One can have a good idea of the general metagame, yet face an undefined specific metagame (consider a player’s first Regional Championship as an example). The best example of an undefined general metagame is when Play! 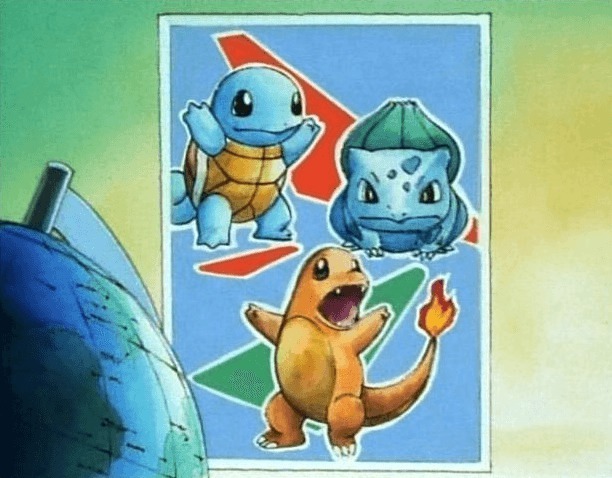 Pokémon decided to do a mid-season rotation before some countries’ National Championship in 2011. As a result, many players had little idea what to expect at some of the biggest tournaments of the year! When a Significant Set of cards is released, it often leads to a great restructuring of deck popularity. It’s not uncommon for counter cards to be introduced to the game which take strong decks down a notch or two. Or, as is the case with most card games, new mechanics are introduced (EX Pokémon, SP Pokkemon, Plasma Pokémon, etc.) that can shift things in an entirely new direction. Keep in mind that the catalyst for this shift in the metagame can come in the form of a rotation of cards or even a “secret deck” that redefines deck choice. There are even sets that cause significant changes to the game because of only one or two cards. Whatever the cause for the change, it is important to remain flexible with your deck choice and play style. There are also cases of a Wide-Open Metagame in which there are so many viable decks that patterns from tournament to tournament are hard to define. While metagames like this can be fun to play in, they oftentimes remain frustrating for players who enjoy using counters to find success. The general rule for playing in an undefined metagame is to play a deck you feel is good in a general sense. Since you have no idea what you may be matched up against, there’s little point in trying to play a deck that fairs well against specific other decks. Your best bet is to play something that is a solid choice. A somewhat defined metagame is one in which you have a reasonable idea of what to expect at a tournament, but not enough to make a fully informed decision on what deck to run. In most cases, you will face a metagame like this on the local level, often after the release of a new set or a format rotation. In simple terms, being able to master the metagame means being able to successfully recognize trends. After all, if you knew exactly what decks you would be playing at every tournament, you wouldn’t have a problem finding success in this game. The problem is, players do not know what they will face, and a certain amount of guesswork is required before every event. There are, however, many considerations that can be made to help one hone in on the best deck choice for a given tournament. These are outlined below, and it’s up to you to decipher your own metagame in order to pin down success. 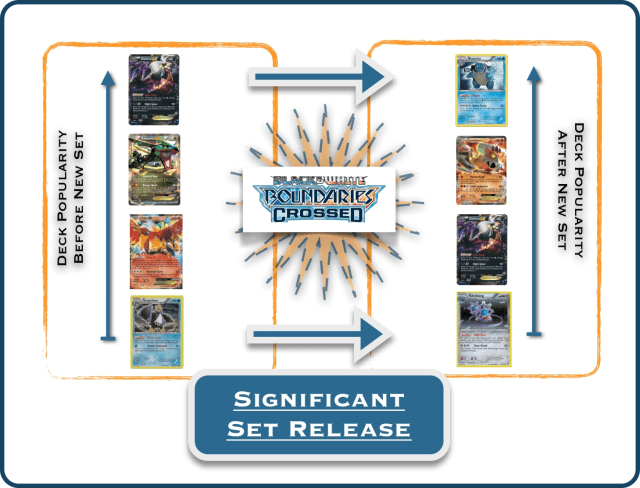 For many players, the “math” at work behind the scenes of the Pokémon TCG can be daunting. Percentages, odds, numbers… all of that stuff gets complex. Still, it’s important to understand the reason mathematically that players switch decks. To do that, I’ll provide an easy-to-follow example that happens at tournaments all the time. Battle Roads and City Championships are a hotbed for the following trend. Given these particular matchups, we can see that LM will win only 30% of the time against BK. RE, however, will beat BK 60% of the time. If you were to go to a tournament in which a third of the field would be represented by each of these decks, which deck would you choose? Let’s assume that every player is of equal skill and every deck list is the same card for card. In order for this example to work, our factors must be equal except for the win percentages listed above. Many players will look at those percentages and get a general feel that BK is the best way to go. It has a close game with RE, yet beats LM pretty severely. This for the most part is what many players do — they get a general feel for the relative power of a deck and fit it into what they know about the metagame, but let’s watch something right quick. 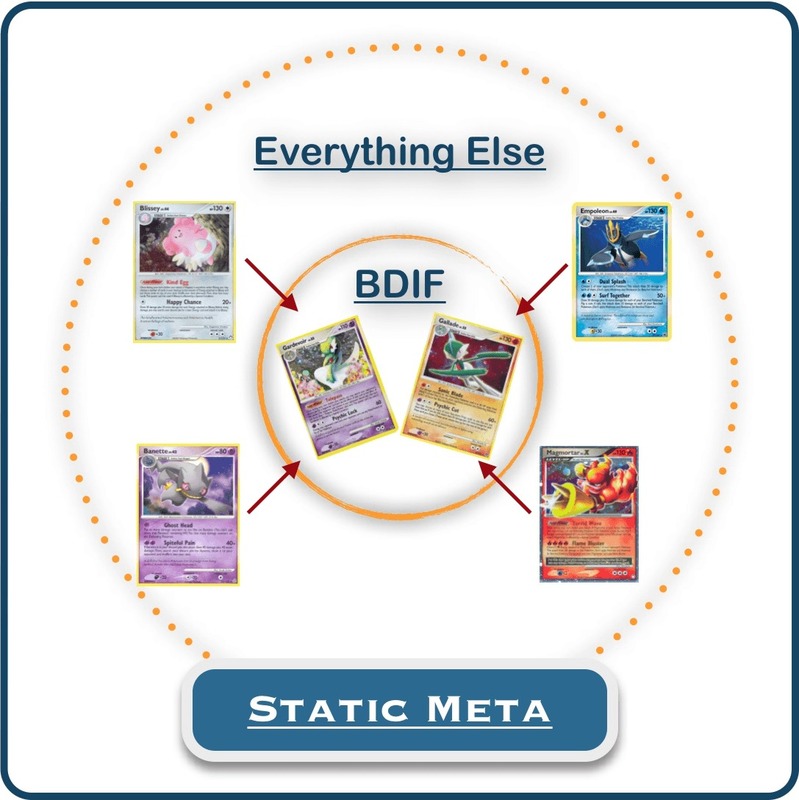 Now, if our metagames were as static and boring as this, every player would know exactly what deck to pick in the above scenario (Blastoise/Keldeo EX). And at first, this is sort of what happens: players migrate to what they feel the BDIF is. Look at this! Given a change in the metagame, RE is now mathematically outperforming the original BDIF. A generalized statement about this change would be something like, “Well, everyone showed up with Blastoise/Keldeo, so I’ll just play Rayeels since it usually wins against that.” The absence of Landorus EX now opens the door for Rayeels to take the top spot. Of course, this won’t last long, as players will continue to migrate from one deck to the next as things shift. A key to success is recognizing that people migrate from one deck to another not just because of the decks people play, but also because of the individual cards people play (or the cards absent in a metagame). During the Winter Regionals, James Proctor landed a Top 8 finish with Gardevoir NXD/Mewtwo EX, a feat that occurred undoubtedly because of players cutting back on their Mewtwo EX count. Garbodor DEX decks show up when people cut back on Tool Scrapper. This same mathematical pattern is not limited to deck choices, but also to specific cards that people play or neglect to play. The important thing to know about this is that you basically want to stay ahead of the curve. As a metagame changes, you too will be forced to change, either by teching for unfavorable matchups or going with a different deck altogether. The next item of consideration explores this notion and helps bring “the curve” into focus. While we can look at a metagame shift mathematically and view the reason behind why players switch decks, there are still many different considerations to make when it comes to picking a deck for a tournament. One of these is the idea of “metagame maturity,” which asks the simple question: How aware of the metagame are the players who make up your metagame? These are tournament results from two different weeks of City Championships during the 07-08 season, and they’re very telling in a few regards. First of all, you can clearly see the metagame shift I described previously, in which a few decks start off in equal spots, but players eventually migrate to the deck that has the best shot at winning. Blissey variants and Gardevoir/Gallade started at near equal representation, but by week 4 players recognized Blissey’s weakness to Gallade and switched over, pushing GG to represent over half the metagame. The second thing that should jump out to you is the prevalence of Blissey during that first week. For the second week of CC’s, Blissey variants made up 30% of the top 2 — actually an increase! By week 3, however, Blissey only made up 15% of the top 2, and it stayed there for the remainder of CC’s. These are interesting trends that show a reconfiguring of the metagame. I mention this because, whether we want to admit it or not, some locations have a more robust, mature metagame than others. Most players will agree that the Florida metagame is very difficult to play in. Tournament marathons (such as the Georgia Marathon) draw large crowds of people intent on winning, leading to a high degree of metagaming. The area in which I play (the Carolinas) has — within the past couple of years — become more and more competitive. Yet, there are some areas in which metagame shifts occur slowly. Looking at those week 1 tournament results, you’ll notice that the two NC City Championships were won by Blissey/Delcatty. Our metagame at that point had a certain lag in it, so that GG decks were only being played by a couple of players. This meant that Blissey/Delcatty was still a viable deck. 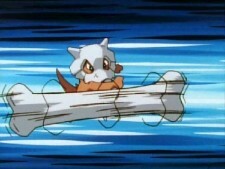 By week 2, Florida was already seeing a counter to GG in the form of Magmortar/Typhlosion. In many ways, metagaming one level higher than a collection of other players is tough stuff. The benefit to analyzing the field and its players can be huge though, leading to a string of wins or landing a “big win” by placing very well at Regionals, Nationals… even Worlds! In this example, our star player does a good job of playing ahead of the curve. He/she didn’t switch decks too soon, which meant that they enjoyed a string of wins with Charizard. 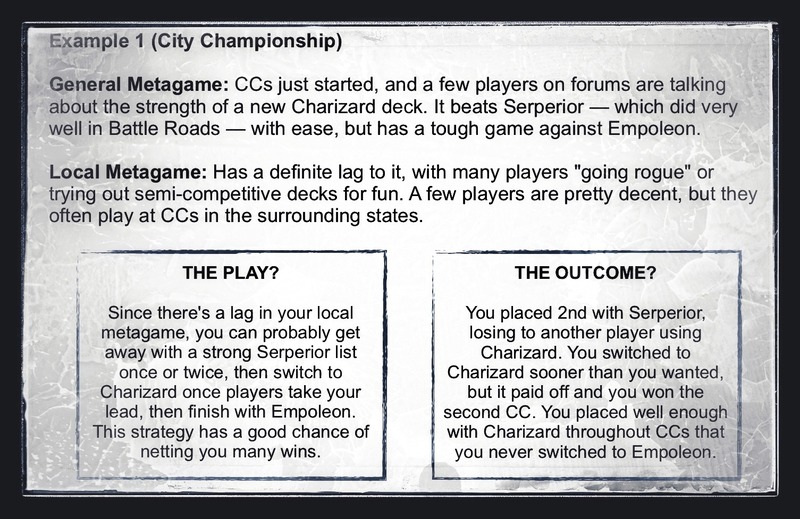 Had they switched to Empoleon, they might have lost to some of the other decks being played. While some of the players in their metagame were probably just figuring out about Charizard, our star player was already winning with it. The lag in this metagame became this player’s road to success. My note at the end of this example is true — I was the foolhardy player using Donphan/Yanmega when everyone thought it was a bad play. Sometimes, the best choice for a tournament is far from popular. With many players still running Zekeels (virtually an auto-win) and CMT a manageabe matchup (especially against players who were new to the deck), I saw an opportunity and took it. No regrets either! Yes, it’s nice to put some numbers behind the trends we see in the metagame. It’s also nice to discuss how “developed” a metagame is and attempt to think steps ahead of our competition. But sometimes a trend in the metagame has nothing to do with the game itself, but rather what’s going on outside the game instead. For many, the price and availability of cards is a monumental concern. While the Pokémon TCG is a relatively inexpensive game, there are still some cards in our format that put a dent in even the most affluent person’s wallet. One big reason that Blastoise/Keldeo EX decks don’t get more play is the limited quantity of Tropical Beach cards out there. And while many players are willing to drop the cash for a playset of Hypnotoxic Laser, a deck featuring four Lugia EX would be underplayed if it were any good simply because of the cost. A lot can be said about this idea — that the choice and construction of your deck should depend on the skill level of expected opponents. It was largely the idea behind my Structured Deck Analysis article (found here on PokéGym). If you haven’t read that article, take some time to do so. It has some suggestions that definitely still apply. Another thing you might do with your local metagame is pin down the playstyles of its main competitors. If you can expect to play against a handful of players because they always make it to the top tables, why not observe their patterns of play? Knowing that one of your biggest opponents likes to stick to the same deck for as long as possible gives you a HUGE edge in any tournament they show up to. These are just a few of the typical playstyles that players exhibit. Of course, this just scratches the surface. Some players favor certain types of decks (speed, heal, tank, etc.) while some players favor certain Pokémon. Some players like to play with Stage 2’s while others prefer decks centered around Basics. Again, it takes some detective work on your part, so get cracking! 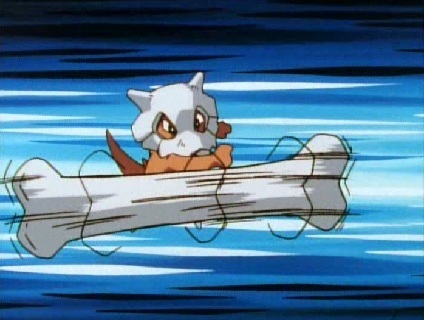 Essentially, most of what I’ve discussed up to now has been a sort of “framing” of the metagame. We can talk about how a general metagame has a rock-paper-scissors feel to it, but that concept breaks down at the localized level. In other words, who cares if Deck A, Deck B, and Deck C are the popular three if everyone in your area is playing Deck D? 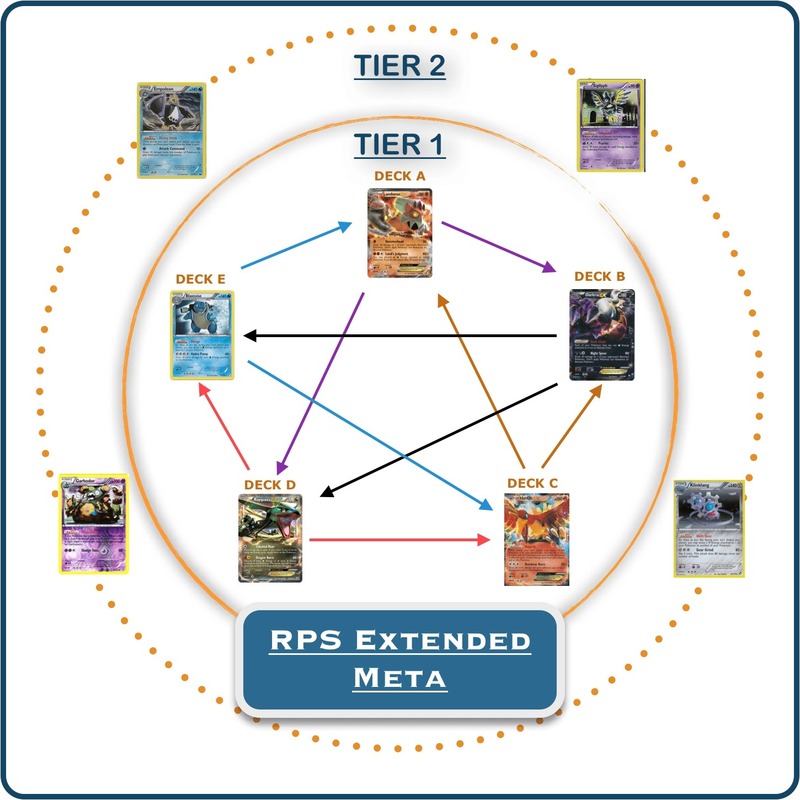 In order to account for this, and piece everything together, let’s take a general look at the “layers” of the metagame. The first layer of the metagame is essentially what I’ve discussed before, the General Metagame. It includes the overarching, general view of the game as seen from players on a national and international level. To find out about this layer of the metagame, visit the popular forums — sixprizes.com, pokegym.net, etc. — and read about what people think is good. Yes, you’ll come across a fair share of hype, but make some wise decisions on your own and be sure to playtest. The second layer of the metagame is also something I’ve mentioned earlier, and it is the Local Metagame. It includes the popular decks/techs in the area specific to the tournament you’ll be playing at. As tournaments get bigger, they attract a larger group of people from a more expansive area. To find out about this layer of the metagame, you generally have to play in it. Though many players are willing to answer your questions, anyone who has done their hard work at analyzing the metagame won’t give away their secrets. The third layer of the metagame is the Individualized Metagame. It looks not at popular decks, but at popular competitors. It combines the knowledge of individual playstyles with all of those other trends in metagame shifts. You may very well get your pen and paper out and keep tabs on decks and techs that the winning players are using. From one tournament to the next, your deck list may change according to what your main competition is playing. 1. Get acquainted with the metagame, at whatever level. Read through some forums, ask players in your area who know what they’re doing, observe metagame trends, soak in as much knowledge as you can and get a good feel for what the other players are doing. 2. Once you’re acquainted, take notes. Keep tabs on what’s winning from week to week, and even write down what certain players used during a tournament series. If you know you have a “One and Done” on your hands, then you can expect them to stick to the same deck. If they’re winning tournaments with that deck, then you have a huge advantage! 3. Analyze your successes… and your failures. You won’t always make the right choice for the metagame. Go back to your notes and the principles outlined here and see where you tripped up. Remember that experience is key to metagaming well, so give it some time and know that just by reading this article, you have a monumental advantage over the other players in your area. 4. Pick out those in the crowd who are “in the know.” Some players, whether they read this article or not, understand the principles behind metagaming. You want to know who these players are and try your best to stay ahead of the curve. I’ve seen players reserve spots in their deck for cards aimed at beating me specifically. These were smart players who remained ahead of the curve, and ahead in the rankings. 5. Remember that metagaming is not just deck choice, it’s card choice. Get inventive with your decks and remember the power that techs have in balancing your bad matchups. Unorthodox plays can lead to a positive result if it’s aimed at the right contenders. 6. Stick with it, even if you fall flat on your face! The principles outlined here are designed to give you an advantage. Sadly, though, I can’t make all of your coin flips come up heads. The Pokémon TCG is a game rife with random happenings, but metagaming properly can give you the statistical advantage over time that you need to be successful. 7. Avoid overthinking it. If the other players in your local metagame aren’t very aware of the metagame, there’s no reason to obsess over deck choice — stay ahead of the curve and play solid. And even if your metagame is very developed, you can still fall into the trap of overthinking things. There’s no need to think about what the other players are thinking that you’re thinking the other players are thinking that you’re thinking about playing for a tournament (my head just exploded). pokemon.theirstar.comAgain, the principles outlined in this article are designed to give you an advantage. But the discussion doesn’t stop here! Find me in the 6P Underground Forums and let’s continue this conversation. Metagaming properly is something that will continue to gain traction as players look for more ways to be successful in this game, and I want YOU to be prepared! Lastly, remember to send any questions you have my way, and I’ll try to get to them as best I can.